The other day I had a random message from Mr GrandOldTeam himself asking if I fancied doing an interview. I thought this was it, I’m finally being interviewed to be a moderator on the site forum, alas it was not this. It was something even better. It won’t be a massive shock to most to find out that I am a huge professional wrestling fan. That’s right I’m a 35 year old professional wrestling fan. **insert your own jokes about that here**. But it is what it is. It’s my soap opera if you will. So when Mr GOT asked me to interview WWE trainer and massive massive Evertonian Robby Brookside for the site I couldn’t help but be excited. I don’t expect loads of people who read GrandOldTeam to know who Robby Brookside is. There’s a small wrestling clique on the site forum who are fully aware of the man, but for those who aren’t, Robby is a retired professional wrestler, you might not have seen him, but he had a couple of appearances on Monday Night Raw and wrestled all over the UK, Europe and USA. These days Brookside is signed to WWE’s development territory, know as NXT. Essentially it is his job to train the next Stone Cold Steve Austins, Rock and Triple H’s. Nice work if you can get it! 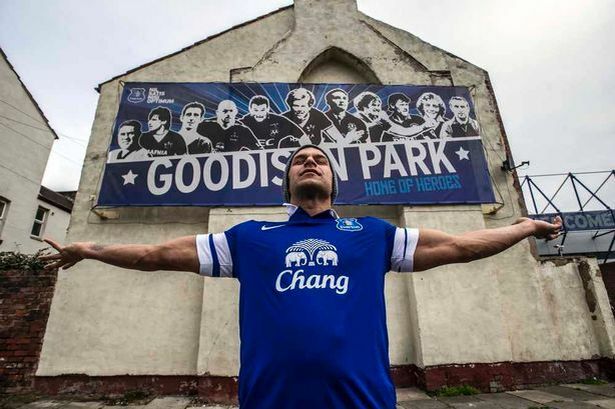 But perhaps most importantly for here, Robby is a massive Evertonian. Born in Kirkdale and absolutely knows his stuff about the Blues. This interview talks a little about Robby coming over to the UK for the NXT Tour and about his love for Everton. A few pleasantries are exchanged at the start as Robby has been up since 6am, getting ready to do a host of these interviews, run a training class and then attend a live NXT show later in the day in Tampa. “To go back to Liverpool, this is a strange story, my mother was 85 yesterday and before I came here I lived in Leicester, and she always used to ask when am I coming up. Well she still says it now as she doesn’t really realise I’ve lived in America for nearly 3 years. So she’s never been to an American wrestling show and next week will hopefully be the first time she’s going to ever see the size and the quality and standard and spectacle that NXT brings. I’m really excited and nervous for my mum to behold this. Just to go back to Liverpool and the Echo Arena is such an iconic arena on the water front and for our talent, some of them it will be their first time in England. I never thought I’d take it to England when I first came here in September 2013. I was only supposed to come for 6 months! It’s been incredible to be part of it. And bringing it to Liverpool, I can’t tell you how proud I’ll be. The bookings are good and we are bringing some incredible superstars over. It’s going to be a hell of a night”. “I was born and brought up in Kirkdale just the bottom or Orwell Road. That’s where I used to walk up to the match. On a Sunday as a kid I used to go for a kick around by the enclosure and re-enact the Saturday. Bob Latchford was always my hero so we’d go in. Me and my mate Tommy Lewis used to be Bob Latchford and I used to be Dave Thomas. It’s a state of mind being an Evertonian”. No Summerslam at Goodison then. And that was that. To be honest I could have spoken to him all day about wrestling and Everton. What a top guy. Even if you’re not into wrestling, and that’s most of you, Robby Brookside is a name worth noting as you won’t find a more passionate blue. You can catch Robby and his NXT Superstars at the Echo Arena Wednesday 15th June. If it’s not sold out! Which it probably is by now!